We just deployed a new tool to explore your application’s data. 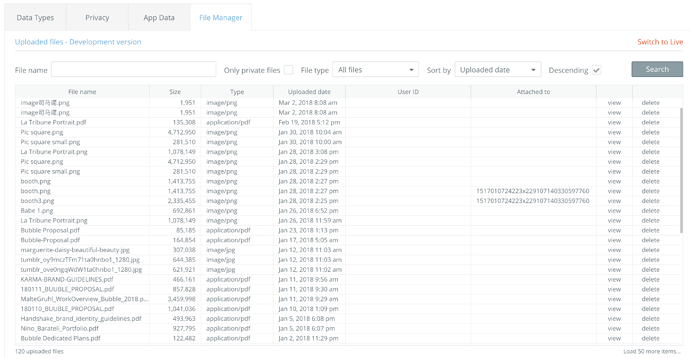 In addition to the App Data section of the Data tab where you can see all the things created in the database, you can now see the different files that have been uploaded by your users (or by you when you edit your application in the editor). You can also search by name, type, whether the file is private or not, etc. The user ID of the user who uploaded the file is also displayed, though we started tracking this only a few weeks ago. You can delete files in this view, but please do this with caution, we do not have the same version control as we have the things. In other words, a deleted file cannot be recovered currently. Note that this tab is only accessible to users with access to data in their apps. I had some seriously random stuff up in there. Not anymore though!! Brilliant! Its almost like we have access to S3, oh wait it does. Much needed, now we can manage and maintain the uploaded files. Great stuff - this was one of my most anticipated features on the Bubble roadmap. Going forward this is really going to help keep our storage pool nice and organised. Thanks. I have static pictures that i uploaded in the editor, (and its also actually attached to things) and i don’t see anything in the file manager, my file manager tab shows no items at all, am i missing something? Make sure you are checking the correct version (Development or LIVE). Also, try clicking the refresh data option to pull the data. By default, it might not load any data. Does this include items uploaded as “Image” or only items uploaded as “files”? When does it get “attached to”? I give the users a multifile uploader to upload videos, and then i save each individual file to a separate thing called “Media” type. But i dont see those uploaded files to be “Attached to” in the file manager, i would expect to show here the ID of the “Media” thing that hold this file. Also i’ve noticed that deleting the “media” thing by the user does not delete the file, i still see the file in the file manager, i would expect it to delete both. 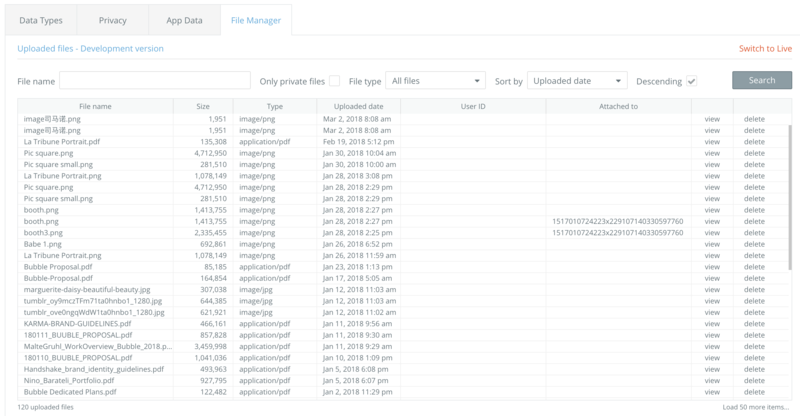 The ‘attached to’ in File Manager is populated when you enable ‘make this file private’ and attach this file to the current user for example. This setting will make the file visible only to that user otherwise anyone with the file link can view the file. You can use the ‘delete an uploaded file’ action to delete a file from app storage. Serious question - how do I “upload a file in the editor”? I understand .jpg files as image visual elements, but the example has .pdf files listed that are not attached to anything. How did those files get in there? You can upload a file (image or otherwise) directly from the editor, by dropping the file uploader on a page in the Design tab > upload file in initial content > the file’s dynamic link appears below and the file will also display in the File Manager. Is there a way to delete multiple files? I have 1000+ that need to go. Got that very same problem, currently no quick way to do that apparently.